Power plays a high important role on the industrial and human progress improving our way of life and the economic development of our society. Continuous access to power must be supplied by power producers while maintaining customers demand and strict quality standards with competitive prices. These are only some of the main challenges faced currently by the power generation industry which are driving the urgent need to change their current business models, searching for innovation and more efficient strategies. In this regard, the power generation sector is experiencing mayor changes worldwide. Renewable energies such as solar or wind are rapidly growing in many parts of the world, especially on industrialized countries. They are widely recognized as environment friendly energies and contribute to meet a sustainable development of our present resources without compromising the ability of future generations. Also they are replacing other traditional power generation technologies such as coal or nuclear. However, most of these renewable energies are highly dependent on weather conditions preventing a constant power supply over the medium and long term. In the same way, Gas Turbines power output is highly dependent on ambient temperature. However, this dependency can be eliminated with Turbine inlet air cooling (TIAC). TIAC is a group of technologies whose objective is to bring gas turbines to work close to 15º C condition independently of the weather. Delivering a constant output on gas turbine units we will be able to avoid the intermittent demand from renewable resources while providing a more efficient power generation supply. Apart from increasing the power output and maintaining it constant in spite of ambient temperature changes, TIAC also creates a direct economic benefit in two ways, increasing the power per unit of fuel, thus making the gas turbine more efficient and reducing carbon emissions. Producers will be adding value to their business model, reducing both CAPEX and OPEX and being more competitive in the power generation market. ARANER has more than 20 years of experience on industrial refrigeration systems and only in Middle East has successfully installed TIAC systems on more than 100 gas turbines. 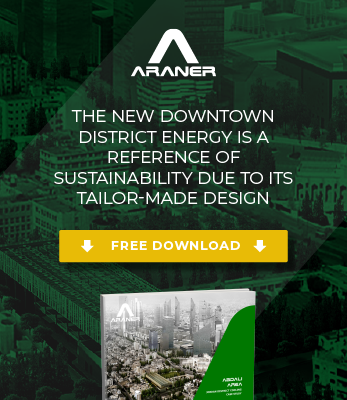 ARANER’s main focus is to provide effective energy solutions that assist the power generation industry to succeed in its goal to guarantee a constant power supply. Therefore ARANER tailor made TIAC technologies are a well proven solution to quick address the major challenges affecting the power industry worldwide. Do you need more information? . Contact ARANER and our experts team will be glad to help you.